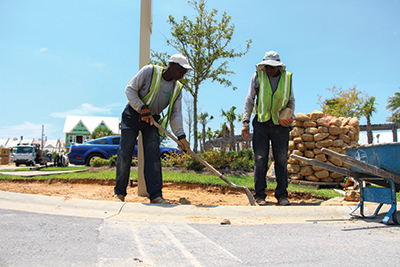 The owners of GreenEarth Landscape Services are ‘scaling up’ by focusing on culture, communications and key metrics. Jeremy Durgan isn’t afraid of an uphill climb. Literally. His personal goal is to summit all 53 of Colorado’s Fourteeners—the mountain peaks with elevation of at least 14,000 feet. Professionally, he and his business partner Shawn Knight have a 10-year goal of expanding GreenEarth Landscape Services to 16 branches between Florida and Alabama by 2027. That’s not a small feat for the Santa Rosa Beach, Fla.-based company, which currently has two branches and will generate about $8 million this year. Their ascent hasn’t—and won’t—be easy, but when you consider the balance these two partners have struck, the plans they have in place and the processes they’ve outlined for executing them, it doesn’t seem insurmountable. 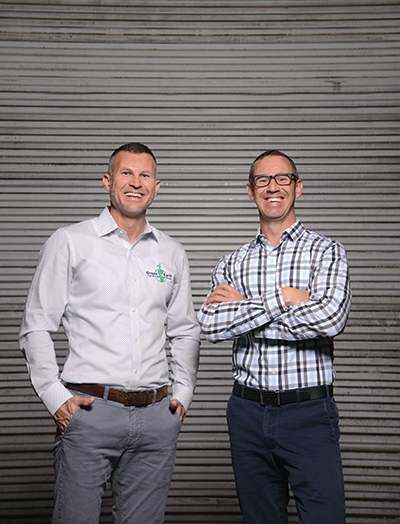 Durgan and Knight met more than a decade ago running parallel businesses. Durgan’s company was focused on landscape maintenance, and Knight’s favored installation. They’d worked together on a few projects, and they both wanted to grow their companies. Rather than becoming competitors, they decided in 2007 to join forces and become GreenEarth Landscape Services. The partners came to this cultural epiphany gradually over the years through various efforts and outside resources. Early on, the duo connected with Ed Laflamme, a consultant with The Harvest Group. In 2012, they signed on for a six-year agreement with LandOpt, a licensing organization that provides coaching and systems to landscape companies. About two years ago, Durgan and Knight were on a hiking trip kicking around how to implement the concepts they’d read about in the Verne Harnish book “Scaling Up: How a Few Companies Make It…and Why the Rest Don’t,” a revision of his “Mastering the Rockefeller Habits” book. “We knew we needed (the Rockefeller Habits), but we needed somebody to help us put it in place,” Durgan says. The Rockefeller Habits are three things Harnish says successful firms get right: priorities, rhythm and data. A few Google searches later, they connected with entrepreneur and business coach Andy Bailey, founder of Petra Coach, which helps clients implement the Rockefeller Habits, among other things. “We knew it was going to be a roller coaster, but it’s been one of the best things we’ve done as a business,” Durgan says. Getting the entire team moving in the same direction was essential to this process, and it required a cultural shift within the business. “Our No. 1 goal was to scale, but the staff was all on different pages,” Durgan says. It hasn’t been easy, but they’ve made progress by defining their core purpose and values, implementing consistent communications and incorporating key metrics for accountability. Getting to that point was a crossroads for the business. In the ever-competitive labor market, these components have become a key part of the hiring process, Durgan says, especially when it comes to adding managers and sales staff. “Our whole goal is to find as many A players as possible,” he says, detailing the hiring process for managers. First, candidates fill out an online application, which includes an optional question. Applicants who choose not to answer it are disqualified. “If you’re not an A player, you’re not going to fill it out,” Durgan says. Other culture-focused activities they’ve incorporated include creating a quarterly theme for the team to rally around. One quarter, for instance, GreenEarth focused on “180 degrees of culture,” where every team member had to share a story about witnessing another staffer embodying one of the core values for a total of 180 anecdotes. “Once we reached (180), we did a companywide field day, which was a blast,” Durgan says. Another reward for achieving quarterly theme goals was extra hours of paid time off. “People think it’s big stuff that makes a culture, but it’s really just the simple things and consistency that make the difference,” Durgan says. One of the Rockefeller Habits is establishing a communication rhythm, and for GreenEarth, that includes daily huddles, weekly huddles and quarterly planning sessions. These meetings have been essential to getting the company’s two branches—which operate 35 miles from each other—on the same page. The daily huddles are quick updates where leadership team members review each person’s top tasks, help needed from others and how they are tracking on their goals. Weekly huddles are a time for team members to share their highs and lows, both personally and professionally. Quarterly planning sessions with Bailey are another vital component. During these meetings, managers decide what the company’s priorities are going to be for the next 90 days and identify the quarterly theme. Over the years, GreenEarth has increased transparency and its focus on performance management. About eight years ago, the company began pursuing the path toward open-book management, inspired by the book “The Great Game of Business” by Jack Stack. Durgan says the way the company has handled open book management has gone through some changes and challenges but has been worth it. “There are no secrets at GreenEarth,” Durgan says—down to how much employees make. Team members know if they want to make more money, there are up to nine state certifications and licenses they can get, which the company will pay for. “The only hitch is you do the studying on your own time,” Durgan says. Employees are also eligible for incentives based on the key metrics GreenEarth tracks. The company created a spreadsheet in English and Spanish so employees can track their payouts by quarter if the team meets its goals. These measurables—which were chosen because the entire team can affect them, Durgan says—are net profit, client retention percentage and the number of days in accounts receivable (A/R). These items are monitored in real time in a goal-tracking software called Align. They are rated as green, yellow or red—or “super green,” which means the team is knocking it out of the park and will max out their bonus potential. At first glace, A/R seems like an office-only problem. That’s not so, Durgan says. Today, the goal is to get paid in 20 days or less. The company settled on this metric after it realized that its cash-related struggles were often due to internal problems. For example, a customer could be refusing to pay because of a miscommunication about a few plants that weren’t installed. Maybe the foreman forgot to note that his crew was two plants short, but the project manager billed the client for the plants anyway, which left the client thinking, “Where’s my two plants?” To prevent concerns like this, GreenEarth implemented a job completion check-off sheet. The ultimate goal is to raise awareness about how frontline employees can impact A/R and the company’s performance. “That increase in our cash cycle is important in performance,” Durgan says. GreenEarth’s owners say these initiatives and their own ability to focus on culture and attract new people is what will get them to their high point.